Mobile device management (MDM) allows the controlled management of mobile devices including smartphones, tablet, and personal digital assistants (PDA) in a centralized way by business administrators through the use of specialized hardware and software. With various business enterprises permitting workers carry their own electronic devices to work, the concerns about data security, and cybercrimes is seeing a steady rise. To find a solution for these problems, businesses are increasingly making use of mobile device management solutions owing to the unique aspects of such systems, which enable security of emails, browser data, and the implementation of company policy. Through the use of mobile device management, businesses are empowered to integrate the devices of their employees into the official system while simultaneously making sure that data security is not compromised and network breaches are completely eliminated. 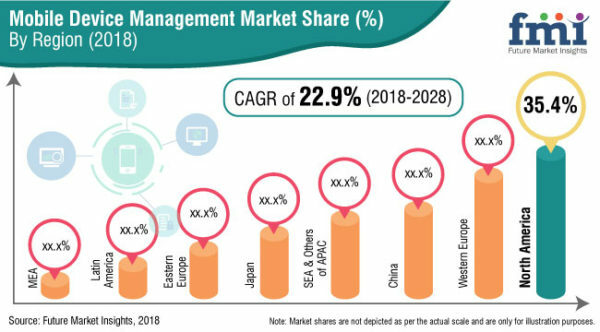 As revealed in a new market research report by Future Market Insights, the market for mobile device management is anticipated to grow at an exponential CAGR of more than 22 percent, reaching a global value of more than 2430 million US$, by the end of next year. The growing trend of encouraging employees to bring their own devices to places of work is gaining a relatively faster rate of adoption in small and medium enterprises (SMEs). This can largely be attributed to increasing affordability of mobile device management systems, and the widespread usage of smartphones by workers, which provides businesses inherent advantages such as performance optimization and extraction of accurate business insights. Modern mobile device management frameworks offer functionalities such as support for multiple operating systems, real-time device location tracking, mobile security, device management, compliance management, email management, app distribution, remote device management, and mobile application management among others, at lower prices. This can not only be used to secure data, but also for boosting workplace productivity through the installation of apps of the business to be uploaded on the employee’s devices. As a result, MDMs are gaining popularity among a wide range of SMEs. According to recent studies, the high potential for workflow automation and software solutions for optimized user interfaces, is going to result in cloud based mobile device management systems to capture approximately 70 per cent market share in the near future. This can be attributed to the unique benefits of having software as a service (SaaS) in cloud format while reducing or eliminating the expenses related to purchase and maintenance of relevant hardware and software, along with vast improvements in MDM flexibility. On the other hand, on-premise mobile management device solutions are significantly more costly as compared to their cloud counterparts. However, since these systems offer better control and security by being integrated to business-owned servers of the datacenters, on-premise mobile device management systems are anticipated to see a relatively higher rate of growth in comparison to cloud based MDM solutions. This is also augmented by the fact that on-premise mobile device management solutions are seeing increased preference by healthcare, government, and financial organizations owing to policy compliance issues. Leading mobile device management solution manufacturers are putting great emphasis on collaborations with other relevant businesses to share technology and product knowledge to develop new innovations for improvements in product performance and functionality, and a bigger market presence. For instance, VMware Inc. and Okta Inc. made an announcement about their intentions to merge VMware’s Workspace ONE MDM solution with Okta’s Identity Cloud platform which will allows customers move their MDM operations to a cloud platform in a more secure and simplified manner by making use of present technology to simplify the process of IT management. Similarly, Blackberry has joined hands with Novalink to collaboratively build mobile device management solutions with the help of BlackBerry Secure Application platform for solving line of business issues, to expand on the functionality of the MDM platform. All the insights and numbers have been sourced from a recent research study, in-depth excerpts for which can be found here.